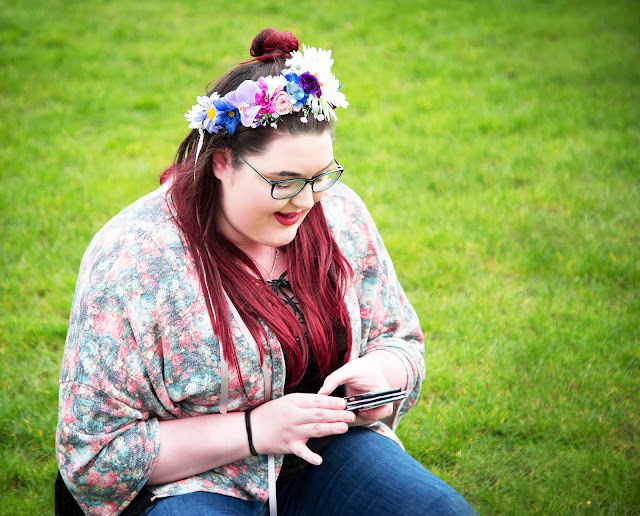 Last month I told you I wanted to get fit and I genuinely thought about the whole "join a gym and work with a trainer" thing, but I'm a plus size millennial so I didn't want to leave the house and walk to the gym, but the bigger reason for not joining was that I didn't want to feel judged for being plus size. So doing what any other self-respecting millennial would do, I turned to the internet for help and it worked! I actually have a list on my phone of the apps I've tried with a rating next to them, but I decided to just focus on my four apps that I couldn't live without, and hopefully they can help you achieve your goals too. 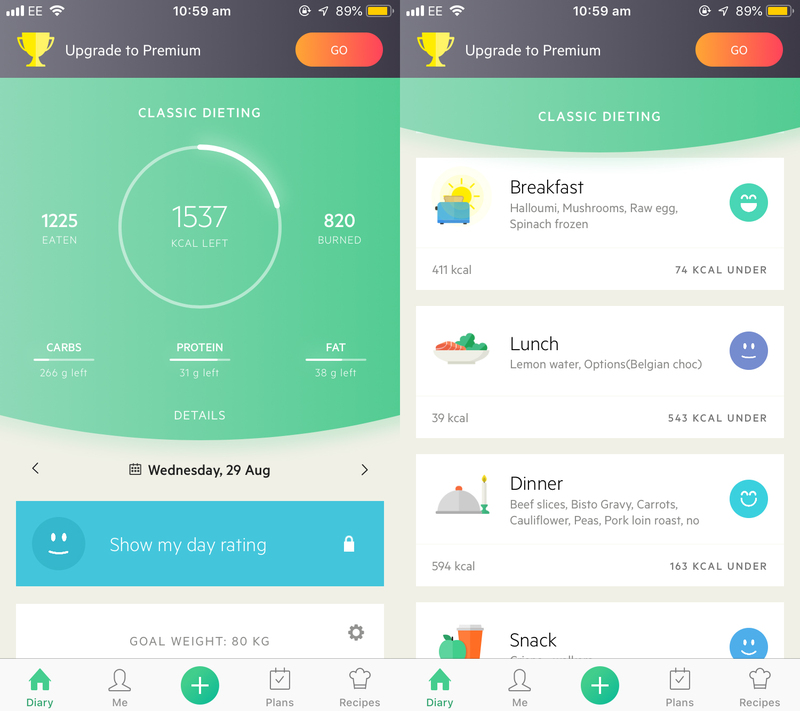 Lifesum was the first health and fitness app I downloaded and even though I don't use it that much anymore it has really helped me. 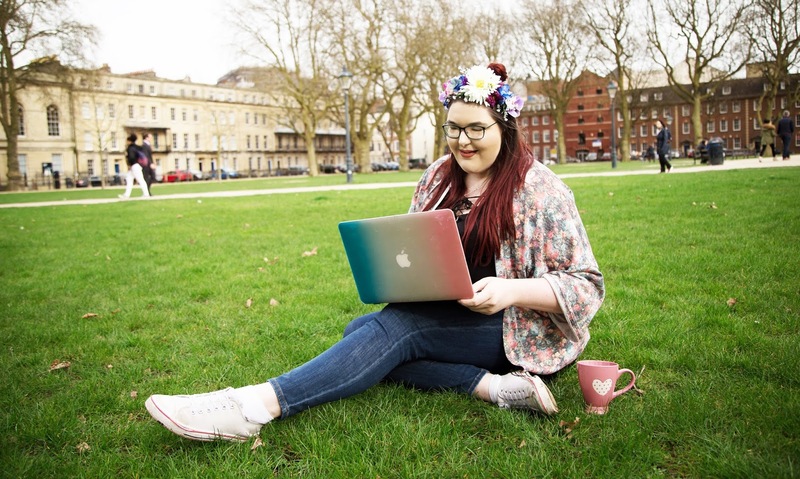 As a plus size blogger I hear the usual "stop eating KFC, get some lettuce for a change" or "you're fat, stop eating" from clueless keyboard warriors who think they're doctors pretty much on a weekly basis. Before I started changing anything I actually just monitored my daily eating habits for a while. The first thing I noticed is that lunch just isn't a thing that exists in my world - it's a small snack that you eat somewhere around 1pm. The second thing I noticed is that I'm way under my calories every single day. Lifesum isn't meant to be a weight loss tool, so when you exercise it puts your calories up so you maintain your weight which I find annoying, but working out my calories I should be eating around 2100 but a big day for me hitting 1200. I always thought I ate healthily but since tracking my meals I've realised that some "healthy" things are a lie and that cheese isn't the devil. Since starting to track and change what I eat I've barely had any migraines- I thought they were just part of me but apparently it's because I haven't been eating enough. I still only manage 1200 calories a day if I'm lucky, but it's a much more balanced diet, I've stopped getting migraines and I just don't get hungry so I suppose that's all my body needs. I love that Lifesum gives you a smiley face for every meal because it makes it easier to recognise what's good for you, although I always get a neutral face because I don't eat enough calories. You can also scan barcodes which is incredible as it saves you inputting things, and you can track your water which is automatically adjusted if you exercise. Once I'd sorted out my atrocious eating habits, it was time to get a bit more exercise as being a blogger means you barely move all day. Originally I didn't want to do actual workouts but I wanted to be encouraged to walk more, and since PokemonGo has had it's 15 minutes of fame already I wanted to try something different. Sweatcoin is an app that "pays you" to walk. It'd take you years to earn anything decent, but they do have smaller gifts if you're impatient. You can earn a maximum of 5 coins per day on the free plan which is perfect for me, but if you walk more you can upgrade to a plan that lets you earn more. The best part is you pay with the sweatcoins that you earn from walking so you never have to use real money for anything. 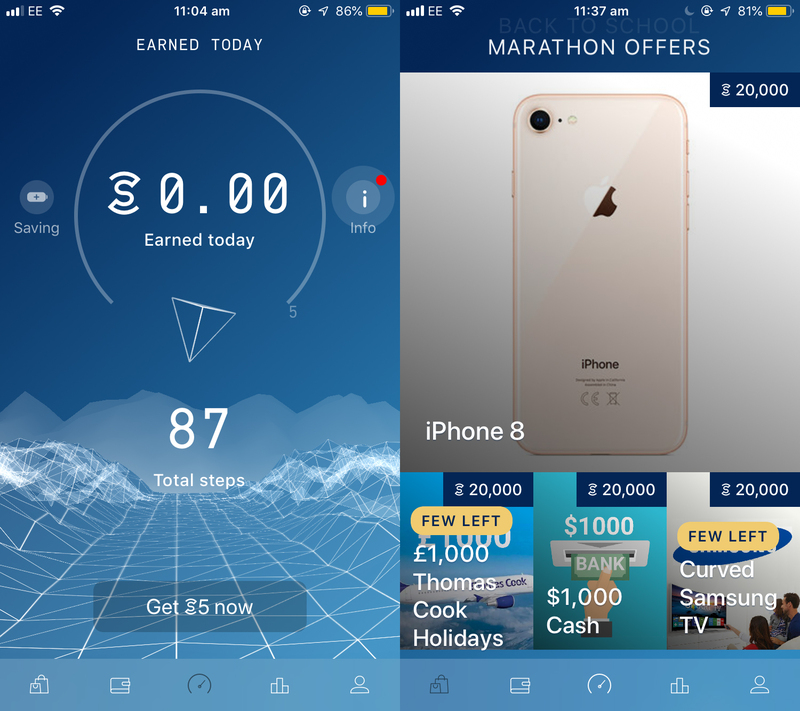 Even though you earn so little from this app it's really motivating - watching the coins tick up encourages me to walk more, and if you're already walking, like to work and back, then you might as well download it as it's something for doing nothing extra. However, be careful because even on power saving mode it kills your battery - if you're planning to use this then take a battery with you because you will need it! Also the app uses your GPS data to calculate how far you've walked so you don't earn anything if you're walking around inside all day which is frustrating. I wasn't originally going to do workouts, but apparently exercise is addictive. Once I started making sure I was walking a few miles a day I found myself with more energy to burn so I wanted to exercise more. After a quick Google I found 8Fit and I love it! 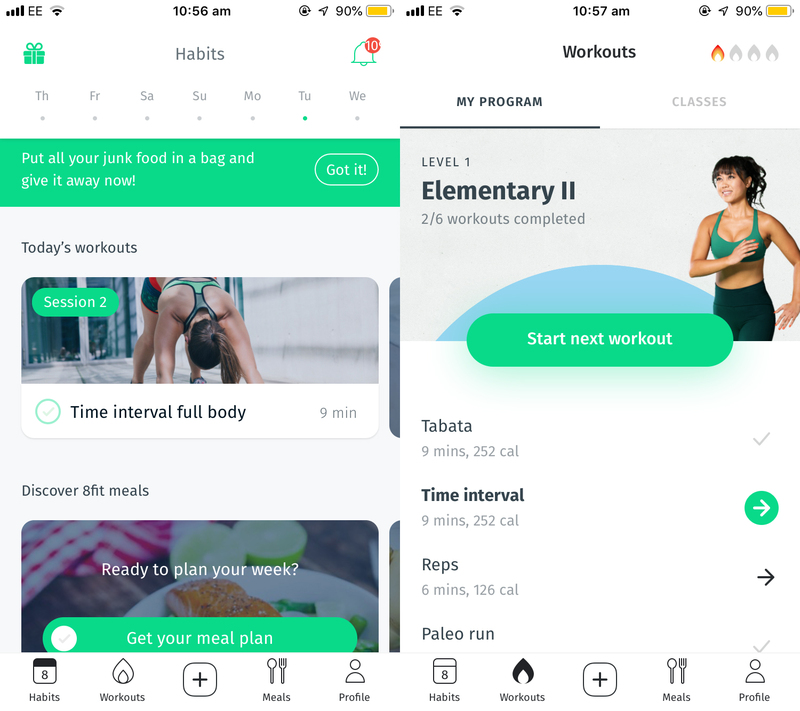 If you're now wondering why I use 8Fit as well as Lifesum it's because you have to pay to log your meals on 8Fit and you can't put in any exercise that you haven't done on the app, whereas you can on Lifesum. The reason I love this app is because it starts from "I've never exercised in my life" and it gives you a list of workouts to do, steadily pushing you so without realising you get to a point where you're a lot fitter than you were but because the app changes gradually you don't notice it too much. The workouts are only 10 minutes each so it's great if you're short on time, and you don't need any equipment so you can workout at home. You also have the ability to swap exercises within the workout, so if there's something you hate doing or you have an injury then you can easily adapt it. Or if you're lazy like me you can move them around so all the floor work is together rather than having to alternate between standing and floor. I know it's ironic when the app is about getting you to move more, but we all have our weaknesses. 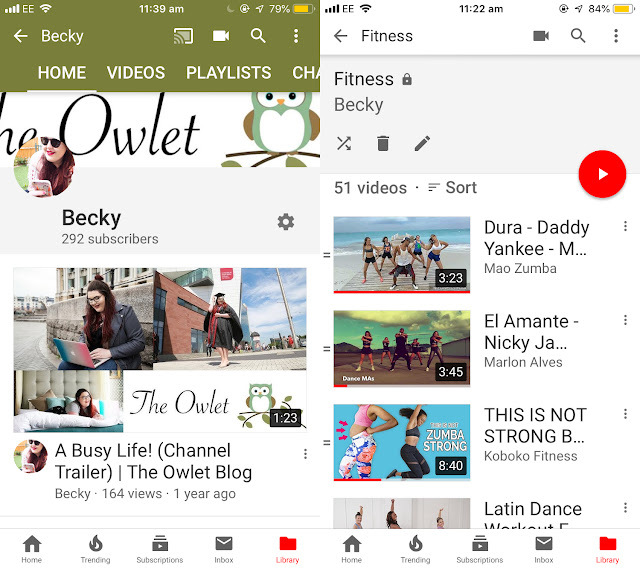 I know you're probably thinking this is a cop out, but Youtube is honestly the best and possibly the oldest fitness app there is. There's videos going back a decade, you can pick from thousands of trainers, there's plus size specific workouts, zumba, dancing, weights - literally everything you could possibly want and it's all free. I've found that I get bored doing normal workouts but I love Zumba, especially if I'm learning to dance to one of my favourite songs, although I've also found a few other videos that are really helpful. Ballet Beautiful is the most painful workout but I've already seen a huge difference in how my body looks. If you're looking for some suggestions here's my fitness playlist, although I didn't create it to share so it's not in order and there's a few random ones that I don't actually use - it's a start though. Perhaps while you're there you could subscribe to my channel because I do actually have a few videos coming up. All of the videos in my fitness playlist are free to access, and of course you know how to get onto YouTube! I hope that seeing what I do has helped you if you're lacking in inspiration. The biggest tip I have is to just do something - if you can then start by walking instead of taking the bus or driving. Once you've started moving you'll find yourself with more energy to do other things. Thank you to the person who asked me to write this- I always love getting blog post suggestions from you so if you ever think of anything then let me know!